The Causeway bridge New Orleans, Louisiana spanned Lake Pontchartrain to connect New Orleans to the mostly rural, sparsely populated St. Tammany Parish. The first span was built in 1955 - 1956 and opened August 30, 1956. The second span was built in 1967 - 1969 and opened May 10, 1969. The northbound span extends 23.87 miles and the southbound 23.86 miles. 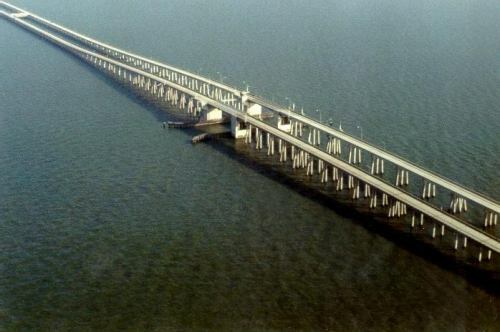 The Causeway is the longest overwater highway bridge in the world.